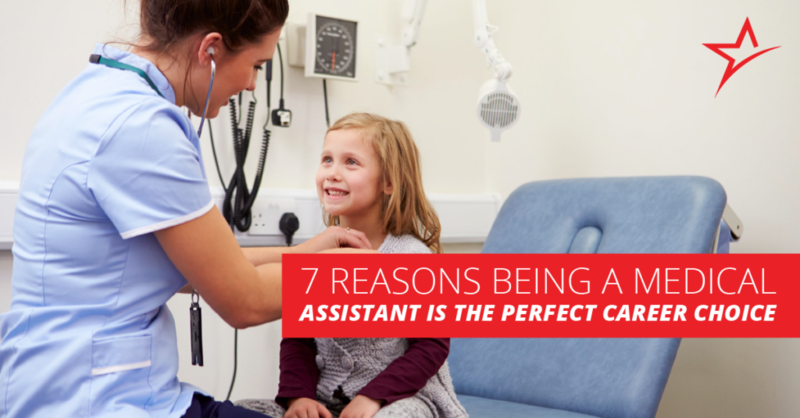 Becoming a medical assistant doesn’t take long, and the job is rewarding in so many ways. You might be interested in a management job, a particularly interesting area of medicine, or maybe you want to go into teaching. If you’re looking for stable, meaningful work in one of the hottest fields, look no further than these seven reasons why you should pursue a career in medical assisting. Becoming a medical assistant is a fast track, from start to finish. Most programs take a year or less. Our Medical Assisting program takes just 10 months, along with an externship of 180 hours in an ambulatory healthcare facility, so you’re 100% ready to jump into the field and start a career. It’s not always easy to get a job. But when you’re a medical assistant, you’re in demand. In fact, this occupation is growing much faster than almost any other occupation. As baby boomers get older, they need more preventive medical services. We’re talking about 76.4 million people, or almost one-third of the U.S. population — and almost all of them will be involved in the healthcare system. That’s a big demand! Being in a high-demand industry has advantages: It’s a very stable career, and the pay trends high. The average wage for a medical assistant is currently $32,946, and ranges between $30,377 and $35,570. The great demand for medical assistants means job turnover is low, and the industry is largely protected from layoffs, even when the economy is bad. You love working with people! You want to be a light in someone’s dark moment, or just add a smile to their day. If this describes you, you might make a great medical assistant. Medical assistants interact with people daily, and they provide valuable assistance to the doctors and nurses around them. Many jobs don’t provide an opportunity to make a positive difference in people’s lives, but medical assistants can go home at the end of the day knowing they did. It’s meaningful work! Some people find lifelong careers as medical assistants, and others use the certification as a step in a longer career path. With exposure to so many areas of healthcare, you might discover a related interest or opportunity to pursue a different career — and medical assistants easily can. For example, careers in nursing, medical coding, and allied health management may be of interest to you one day. Ameritech’s program trains students to work as medical assistants in any ambulatory healthcare facility, which means you have numerous specialty options. If you’re a medical assistant, you’ll never be bored. Medical assistants work in a variety of environments like hospitals, medical offices, patients’ homes, outpatient facilities, surgical centers, and medicine clinics. Responsibilities include clinical duties like drawing blood and performing basic lab tests, as well as administrative duties such as updating patient records, billing, and scheduling. Ameritech graduates leave prepared to work in all of these clinical and administrative areas — and more. If you like work that’s always evolving, you’ll enjoy the job. Medical assistants need to study for and pass the Certified Medical Assistant (AAMA) Exam issued by the American Association of Medical Assistants. This license proves you’re a professional in your field, which builds confidence. You’ll also be working with other licensed professionals, so everyone around you has the same knowledge base. Ameritech’s Medical Assisting program prepares you to pass all of the Medical Assisting certification exams after graduating, including the RMA, NCMA, CMA, and CCMA. Our robust Medical Assisting program prepares students for real-world challenges. We’re also the most affordable private program in Utah. Visit our website today to learn more!